(…) It was a journey of hopes, doubts, anxieties and realizations, starting with a photo hanging in a Lebanese restaurant and ending with a push of my pedals in a country that–at least for most of my life–has been largely synonymous with war. That one photo of a cedar-dotted mountain on a restaurant wall was, like so many triggers before, the catalyst for thought. If Lebanon has mountains, it probably has trails, I reasoned. And if there are trails, then maybe we can ride them. In an instant, any concerns that this country that had only recently emerged from three decades of conflict were banished from my mind. The trail we’re picking our way along is the Lebanon Mountain Trail, or LMT, a long-distance trekking route that runs almost the length of this small Middle-Eastern country. Established seven years ago with international aid, the trail was conceived as a tool to boost tourism and reunite the once-warring Christian and Muslim villages along the route in a celebration of shared cultural heritage. In fact, our ride through the cedar reserve becomes the highlight of the week, following a perfect trail that could have been purpose-made for 2.3-inch tires. It leads us through dense forest to a peak’s summit and finally into a fast, swooping 1000-foot descent that spits us, and several handfuls of clattering rocks, out in the village square of Masa Al Chouf. Entire afternoons of flowing singletrack, like the descent into Tannourine that closes our second day, are juxtaposed with hike-a-bike hell sessions, bushes clawing at our shins and stubbornly stiff juniper branches snatching at our wheels, like the continuation from Tannourine the following morning. “Humans have a reset switch,” says Abajy when I ask him how neighboring villages have been able to forgive the atrocities that they unleashed upon each other through the ’70s and ’80s. The LMT, and projects like it, has a place in helping that reset take hold. 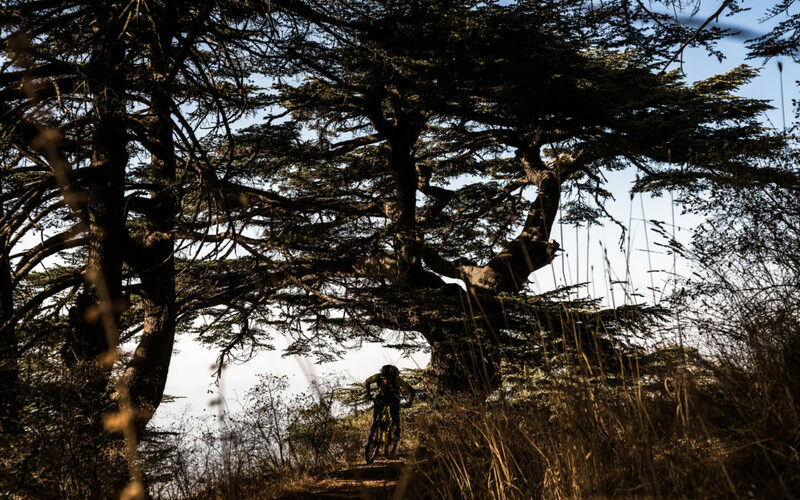 The Lebanon Mountain Trail might be a way off from becoming the world-class mountain bike trail many seek, but the fact that it exists at all is a mighty achievement in itself. Lebanon is back on the map for the intrepid: the independent travelers, risk takers and us adventurers. The tourism switch has been flipped back on. The complete”Flipping the Switch” adventure report, with more on this story and incredible photos was published in Bike Magazine in January 2017. Dan Milner is a professional photographer and mountain biker, world adventurer and writer. Dan Milner writings and photography can be found here and here.